UPDATE: This promo is extended until August 24, 2018! 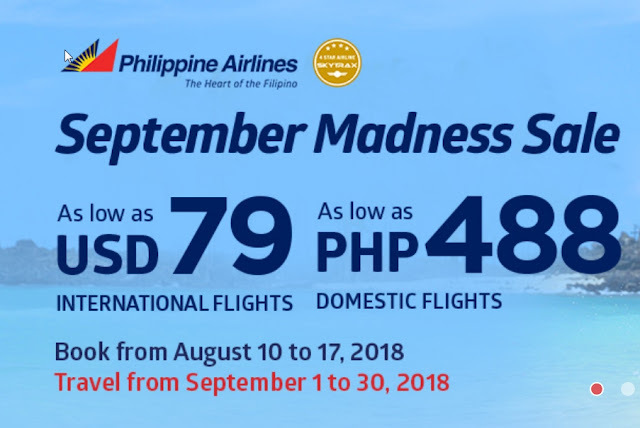 Philippine Airlines (PAL) announces a new promo offering as low as 488 pesos base fare on select destination. The travel period is from September 1-30, 2018. Both domestic and international destinations are on sale. The booking period is from August 10 to 17, 2018 or until promo seats last. You can book your ticket at the PAL's website or visit any PAL ticketing offices nearest you. Here’s a screenshot of the promo poster taken from PAL’s website. The complete list of destinations can be found here. It will not require a huge budget. Taiwan is cheaper than other typical Asian destinations such as Singapore, Japan or South Korea. And all the more you should visit the country, because of the no visa policy. They recently extended the policy until next year. Who knows if this will change next year as the Philippines and China’s relationship gets closer and closer? In this promo, the base fare from Manila to Taiwan is just 109 USD. It’s rainy season during September that’s why I just put this option on number 2. But Puerto Princesa is a really nice place. The Underground river and the beaches offered by this place is awesome and really worth your money. If you still have time, you can go to El Nido, a five-hour drive from Puerto Princesa. There, you can find some of the best beaches in the world. And I mean it! From Cebu to Puerto Princesa, the base fare on this promo is just 488 pesos. I have a fondness for your post. Your posts can help me more and more in the future. .I can solve difficulties by applying them. The writing work is remarkable, and I am so pleased that you were able to share this article here.They are pieces of advice so that I can solve some problems. Thank you for very usefull information.. I got too much interesting stuff on your blog. I guess I am not the only one having all the enjoyment here! Keep up the good work. When I was really young, my mum or dad told me that if I swallowed any type of fruit seeds, a fruits tree will grow on the top of my head. What my mum and dad used to scare me with has now become a fashion trend nowadays. How to Set an Appointment with SSS Online?